OCEAN CITY, NJ (September 7, 2018) – The Ocean City School District just announced the Football MVP of the Year – the MVP Drive. It’s the world’s first self-righting, remote controlled tackling dummy from Rogers Athletic Company and was designed to create safer football practices. According to Rogers Athletic website, “60-75% of head trauma occurs in practice, not in games.” Currently, the dummy is in use by the NCAA Division I, Ivy League schools, the NFL…and now Ocean City High School. According to OCHS Head Coach Kevin Smith, “Football has been on the attack as of late with people saying it’s not a safe sport. I believe football is safer than ever, and it’s advances like this that allow us to make it safer.” The MVP Drive helps reinforce proper tackling technique by moving forward and swiveling to adjust its path. Players must maneuver to hit the dummy properly to make a tackle. The dummy then rights itself after the tackle and can drive again with the remote control. Now the team can work through different scenarios in practice without hurting a teammate or initiate full-speed contact without causing teammates head and neck injuries. The Varsity Football team was introduced to this new technology they dubbed “awesome” the day after Labor Day. Coaches Kevin Smith and Sean Matthews demonstrated how the Drive could steer through them, bump into them, back up and take off on the turf (or grass). A few of the seniors had a shot at tackling the MVP Drive. 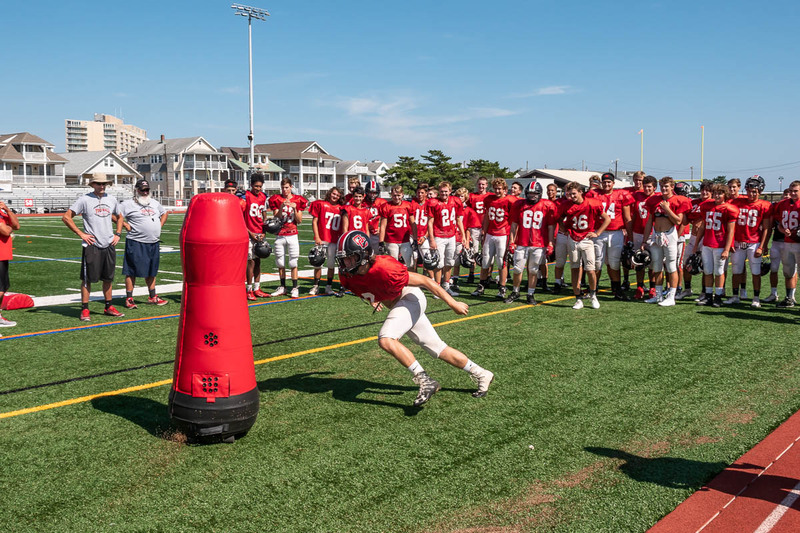 “Now each and every player can make full speed tackles, run drills and punt without imminent injury and consistenatly train at the highest level,” commented Vincent Leavey, Athletic Director for the Ocean City School District. This invention that has been years in development almost didn’t make it to the big time. After a few stops and starts and a lot of interest, it was resurrected. The inventors took the proverbial ball, ran it down the field and scored a touchdown for legions of fans who want to play without injury. Given the recent shadow cast on the future of high school football, the MVP Drive might just have the all the right moves to save the game.